Saito Shihan in the dojo. Based on the lessons of Saito Shihan. 1. The instructors’ techniques should work. 2. The students should be enjoying themselves. 3. The senior students should take care of the junior students. Simply the decision to embark upon the learning of Aikido, or any discipline, is significant. A serious commitment will require ample time, effort and expense, and with the obligations and distractions of modern life, there will likely be true opportunity costs and personal sacrifices when allotting one’s time, energy and resources to the pursuit of learning Aikido. Therefore, any Aikido student deserves a healthy, happy and meaningful experience. Saito Shihan could be very vocal regarding dojo safety, but his safety record, even during a particularly injury-prone time in aikido’s history, make his plan for safe training noteworthy. (There was even a special rule book for “shuriken” – throwing blade – training, which had to be agreed to and signed by each individual before instruction started.) The outline below is based on this great Sensei’s dedication to a safe, productive and enjoyable practice. Although there is clearly overlap, in general, Points 1-11 refer substantially to preserving safety in the dojo. Points 12-16 are largely focused on keeping harmony in the dojo, by which we mean a cooperative environment where the mutual goal is to inspire confidence in and camaraderie among dojo members. 1. Hazing and abuse of any kind (physical, verbal, emotional) is never tolerated. Various forms of high school and university hazing were not uncommon in Japan during the 1970s and 1980s. During this period, Japanese college aikido clubs would frequently engage in the hazing of lower classmen, resulting in serious injury, even death, due to the excessive abusive use of shiho nage and other techniques. Fortunately, such irresponsible and reprehensible behavior has decreased significantly in Aikido. Nevertheless, instructors and senior students should stay vigilant to stop dangerous cultural practices in its tracks. Steps should be taken forcefully if the safety and harmony of the dojo are compromised. These include the reasonable screening of potential new students; immediate disciplinary action of students demonstrating dangerous behavior; and the quick removal of offenders who, in the instructor’s estimation, threaten the dojo environment. 2. Instructors should develop a training protocol where "nage" (thrower) takes “uke” (receiver) to the point at which the uke’s balance has been broken, and then throws or pins in a controlled and gentle manner. Saito Shihan would say “awase wa kibishute, nageru no wa shizuka.” That is, “The blend is severe, but the throw is quiet or gentle.” This preserves the martial spirit of Aikido without the grief of injuries. Saito Shihan would also firmly explain that to throw a partner severely, after his/her balance was already broken, was neither gentlemanly nor becoming of a samurai. 3. Students should be instructed to train slowly and smoothly. Hans Goto Sensei, 7th dan, is fond of saying, “Slow is smooth and smooth is fast.” The understanding that the virtue of speed in the martial arts is not in impulsive use of techniques, but rather in their deliberate execution, will better enable nage to find the safe breaking point (and efficiency) for each technique. 4. Students must take personal responsibility for protecting themselves. Students should be mentored to report physical and emotional concerns immediately to the instructor. Students should also be encouraged to mark their uniform or body, with say, red tape, to indicate sensitive or ailing spots. Most partners appreciate knowing where their partners have injuries and are only too happy to adapt their technique accordingly to avoid aggravating any sore spot. For a variety of reasons, it is still not uncommon for martial artists to hide or not admit to injuries. Nevertheless, in a modern dojo, it is imperative that the Sensei have a clear understanding of the current injuries among the student body. The Sensei should periodically, and perhaps before each class, inquire about any injuries. With this information, the Sensei may want to change and/or modify the techniques for that class. 5. Avoid resisting the technique. Since, in regular class, uke knows nage’s technique in advance, it is relatively easy, but highly improper, to make mean-spirited adjustments to foil nage. Saito Shihan would be furious when he saw, for example, uke bearing all his weight down on nage to keep him from executing a technique. He would explain that uke should have a “junsui” or pure mind and act as if he/she did not know what technique was about to be executed. Inappropriate resistance of the technique – such as a muscular uke out-muscling a physically smaller nage – can result in nage applying excessive force and/or changing the technique entirely to achieve the [incorrect] aim of bringing uke down to the mat. This can be quite dangerous and lead to injuries and/or create negative emotions on the mat. Instead, if nage is struggling with the technique, uke should guide nage into the correct movement, without excessive verbal commands, allowing him or her to feel the technique. 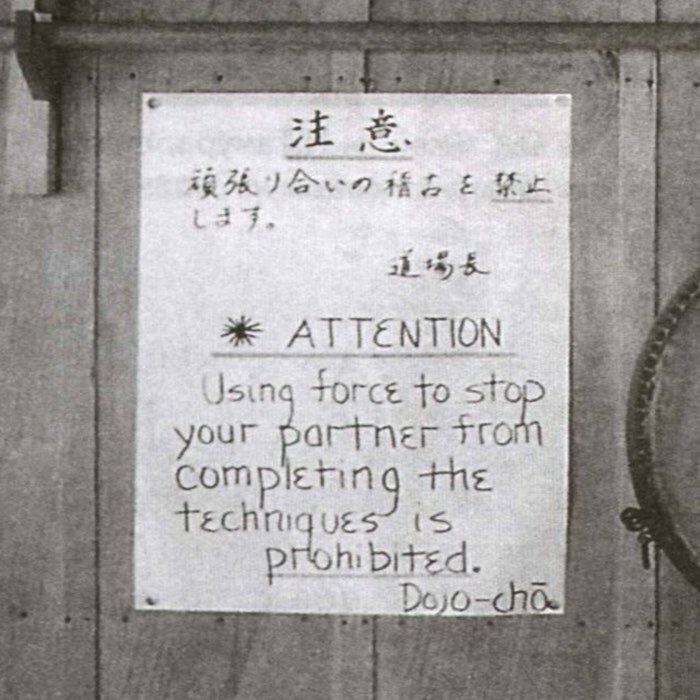 The late Stanley Pranin reported his personal experience, in the Aikido Journal, of a time when he was training with a strong student who, knowing what assigned technique was coming, would continually thwart Stanley’s throws. Saito Shihan watched for a while and then finally erupted in anger, shouting, “Dame! So iu kudaranai keiko yamero!” (Stop that stupid training!) He then kicked the offending student out of the dojo. After receiving sincere apologies, Saito Shihan readmitted the remorseful student one month later. To create a clean start, Saito Shihan actually introduced the “new” student to the dojo as if it were his first day and even announced the name of the student as if no one had met him before! Today, that student is quite a respected, successful and well-known Sensei and surely passes on Saito Shihan’s message to students that during training, uke should cooperate and collaborate with nage to properly learn the techniques. 6. Always throw to the outside of the mat whenever possible. Imagine a swarm of flying bodies. This can describe the interior of the mat if students are not given the specific instruction to throw to the outside, and is typically where crashes and injuries occur. Recently, in my class, I did not adequately convey this message to our students and two bumped heads quite solidly. While no real injury resulted, it was a frightening and sobering reminder to always throw to the outside of the mat. 7. Always look around you before swinging a jo (wooden staff) or bokken (wooden sword). Make sure there is a wide berth to freely express your weapons practice. Disregard of spatial awareness may result in expensive damage to items common to aikido dojos like wall mirrors and calligraphy scrolls, or, worse, personal injury. At a recent major Aikido seminar, I witnessed a student on the other side of the room, standing too close behind someone swinging a bokken, receive a bloody strike to the head. Fortunately, the injured party did not have to go to the hospital and sincere apologies quickly followed. There were many contributing factors to this accident. These included the unusually large size of the class with about 100 students, the substantial number of bokkens being used at one time and the intensity of the practice. There were probably a dozen or so lines of about eight people in each line. Since the total group was too large for any one Sensei to supervise by himself, each line leader should have been substantially responsible for the safety of his/her people. The lesson we impart to our dojo is to be extra aware of your position on the mat during a weapons practice. If you are trying to make your way around a weapons class, be sure to not only take a wide path around participants, but if possible, announce your presence and/or wait for a break in the action before walking well and safely behind. 8. Nage has substantial responsibility for the well-being of uke. Saito Sensei would often explain that especially on backfall thows, since humans do not have eyes in the back of their heads, that nage has responsibility for the safety of uke. Nage needs to make critical decisions regarding the direction, timing and intensity of throws to protect the health of the uke. 9. Never wear jewelry while training to avoid injury to your partner or own self. A few years ago, I accidentally cut the lip of my partner with a knuckle on my right hand while throwing. Not only was my partner not especially pleased with the consequences of my mistake, he also noted that I was wearing a wedding ring on my left hand. He correctly pointed out that the injury could have been much more significant if my ring had, say, made contact with a tooth. His observation was valid and I now make it a routine to remove my wedding band before practice. 10. Never train when intoxicated or compromised by any drug. In Japan, especially in the countryside, during the 1970’s and 1980’s, the culture often encouraged the consumption of alcohol. This did have certain social benefits, including the promotion of personal bonding. However, one morning, I reported for practice following an evening where I had unsuccessfully attempted to compete with my future brother-in-law in a regrettable series of drinking games. Saito Shihan took one look at my condition and kindly suggested that I skip practice and sleep it off. There was another time when Saito Shihan began instructing a class immediately after entertaining and liberally drinking with some important guests. At the beginning of class, he stumbled badly and recognized that his ability was compromised due to the effects of the alcohol. He then assigned the most senior student to take over and walked home. 11. Keep nails clean and trim and follow common-sense hygiene. A scratch or poke of a dirty nail can cause quite a nasty wound especially if in the eye! Also, clean uniforms and mats are always much appreciated by everyone and make training much more enjoyable. 12. The senior students should be kind to and care for the junior students. The “Senpai,” or senior students, must support the Sensei and appropriately convey the techniques to the “Kohai,” or junior students, during training and ensure that the culture and rules of the dojo are followed. Typically, in an Aikido dojo, students of all ranks and proficiencies train together. This can be quite intimidating for new students to be thrown, so to speak, on the same mat with quite advanced students. Therefore, it is imperative that Senpai go out of their way to teach new students and keep them safe, educated and reasonably comfortable. A formal mentoring program should be considered as well to ensure that a new student have a relatively smooth transition into the dojo. For a dojo to flourish, it is important for the Senpai to be firm but very kind, patient and understanding with their Kohai. 13. Minimize verbal instruction with your training partner. There should be a minimum of verbal instruction between training partners. Excessive verbal instruction can be distracting, confusing and cause tension. Saito Shihan, when instructing, would often provide nominal verbal explanations and was amazingly effective via a pantomime technique. Real learning typically happens quicker by watching carefully and “stealing the technique” – a Japanese concept whereby the student is supposed to watch the instructor and appropriate the technique – rather than via a lecture. During the course of training, especially vigorous practice, accidents do happen from time to time. Toes get stepped on, joints may be tweaked too hard or people get thrown off the mat or into others. Even when there are no physical injuries, feelings can get hurt. In order to quickly diffuse negative emotions, please remember to always quickly and sincerely apologize. During training in Iwama, if someone was thrown and unintentionally bumped against another couple training, it was not uncommon for all four people to immediately sit in seiza, take responsibility and apologize to the others. This allowed for an easy and peaceful resolution in, sometimes, was an intense environment. In Japanese baseball, when a batter is hit by a pitch, the pitcher will often immediately remove his cap, bow and apologize to the batter. More often than not, this seems to mitigate any hostile feelings. In American baseball, when this occurs, the batter and pitcher tend to glare at each other. Then the opposing pitcher may attempt to reciprocate and hit a batter. Quite, simply, whether on the mat or in daily life, the world should be a more peaceful place if folks simply expressed sincere apologies upon hurting or simply inconveniencing others. 15. Training should be fun and enjoyable! Enjoying oneself is not incompatible with rigorous and sincere training. Take training seriously, but make space to laugh and appreciate. Hopefully, on most days, training is a joyous experience, which is key to a happy and successful practice over many years. 16. Always sincerely thank and appreciate your partner for their cooperation and generosity. Your partner is generously permitting the use of his/her body in order to mutually learn the techniques. That is, they are willingly accepting physical risk and discomfort to facilitate their partner’s learning. Therefore, it is not only an obligation to protect one’s partner from injury, genuine appreciation should be expressed for his or her help in learning and perfecting the technique. At Mill Valley Aikido, we are establishing a tradition where at the end of class, every student, from Kohai to Senpai, individually expresses personal thanks to every other student in class by knee walking up the line and bowing to each successive Senpai. While it does require an extra minute or so, it is our belief that this little ceremony of appreciation will foster mutual kindness, respect and collaboration. Set a good example for your dojo, your community, and the next generation. Each Aikido dojo is unique (ex. general age group, level of overall health, experience in other martial arts), but these guidelines – which reflect generations of experience and progress – along with some good old-fashioned common-sense, will promote the safe and cooperative learning environment, common to every top school. Ultimately, the senior instructors have the first and final say, and we feel confident if they embrace the above guidelines, dojo members will follow and help promote dojo safety and harmony, making room for the development of the very best Aikidoka.